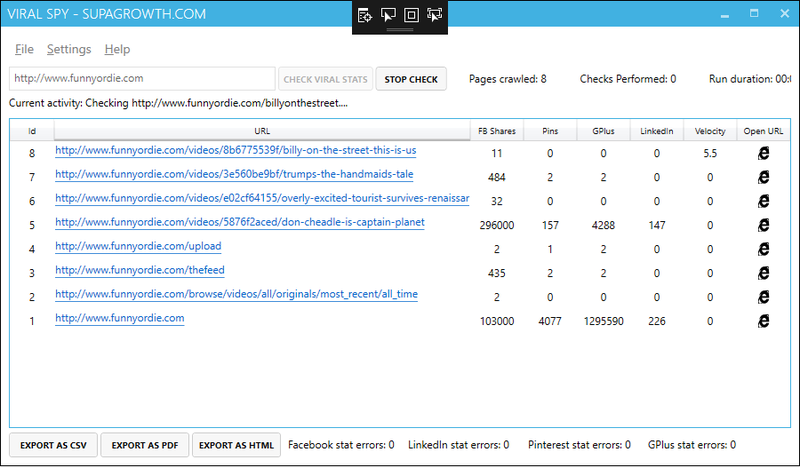 Viral Spy - Want to know which of your competitors pages are shared the most? Viral Spy is a desktop application that will crawl your competitors website checking each page to see how many Facebook shares, Google Plus Tweets and LinkedIn shares it has. It it can extract a date from the page it will even calculate the share velocity for you so you can tell which pages were shared the fastest. How does Viral Spy work? Simply enter your competitors website and click start, its that simple. All links are extracted as the crawl goes along so you don't have to do anything. If you want your content to go viral then you need to know what people want to share in your niche, a great way to do that is to simply look at what your competitors website visitors are sharing on social media. What does Viral Spy look like? This is the transcript from the video above, it needs tiding up a little as its from YouTube subs. Hi guys it's Jamie from MaxResultsSEO.com and in this video I'm going to show you how to use my viral spy software tool. Now basically, all this does is pretty simple you basically give it a website and it will go off to that website crawl all the pages on the website and then bring back all the social statistics it can about each page on the website and that information is quite valuable because you know if you're trying to make something go viral, you can look at your competitors and you can see what's worked for them. You can see which of their content has actually gone viral and been a success. So I'll quickly walk you through the options. So here we have crawl settings, so this is the seconds between each threads crawl and this is the amount crawls that you want run concurrently, that's a pretty safe setting how it is, you can crank it up a bit more if you want just you know, if it's someone else's website and it's on cheap, shared hosting. Just be careful, you don't you know, knock it out by setting that to 100 or something and having a hundred requests fire them at once. That's pretty much the settings for this once you've got your results you can export them as a CSV, PDF or HTML. That's pretty much it, so I've targeted Matthew Woodward's blog, a popular internet marketing guy and you can see now it's crawling his website working out where all the pages are and then pulling back all the Facebook shares, Pinterest Pins and Google and LinkedIn shares each page has. One interesting thing I coded in is the share velocity now, if it can figure out reliably when that page was published, it will try and calculate the share velocity and basically, what the share velocity is is how quickly it's been shared. So if you have say, you've got two different pieces of content to different web pages and one was published five years ago, but and it's had you know a million shares and one was published a week ago. It's got half a million shares, although that, although the newer piece of content has less shares, it's more viral because you know it's only been published a short amount time, so the share velocity if it can reliably extract a date out of those pieces of content, then the share velocity will be much higher for the newly published ones. That's pretty much it if you've any questions come to MaxResultsSEO.com and fire me a message. Thanks for wathing guys.